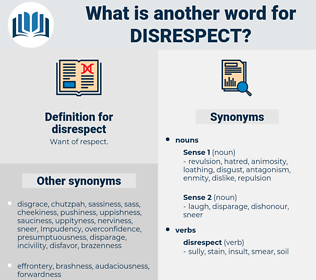 What is another word for disrespect? Flouting, violation, contravention, infringement, observance, noncompliance, non-adherence, failure, lack, Non-fulfilment. contempt, disregard, defiance, Non-observance, non-compliance. reverence, manners, civility, politeness, esteem, courtesy, humility, honor, regard. suitability, politesse, suitableness, submissiveness, respectfulness, propriety, rightness, friendliness, hospitality, goodness, dutifulness, correctness, geniality, decorousness, grace, deference, felicitousness, considerateness, thoughtfulness, affability, modesty, gracefulness, fitness, appropriateness, meekness, seemliness, acceptability, decency, respectability, respectableness, kindness, consideration, cordiality. You are my mother's father; and that word - father, means so much to me, that it shall shield even you, from the shadow of disrespect. The good man intended no disrespect, as he told me afterward. infract, offend, go against, violate, breach, transgress, break.